Our activities take place in the Lake District, Cumbria UK Adventure Capital- from Keswick in the North Lakes to the South Lakes and Lancaster . 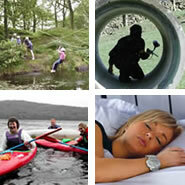 Whether you are looking for an exciting and exhilarating experience, an corporate event or a relaxing break, Activities in Lakeland can offer you a wide range of choices. Use the left menu to view activities we offer. Once you have decided on which activities interest you, the dates you intend to come to the Lake District, and how many people will be in your party, contact us and we will confirm prices, check availability, and discuss the finer points with you.